2017 marks the return of hidden blades and hooded tunics thanks to the launch of Assassin’s Creed Origins, and boy, it is a big one. 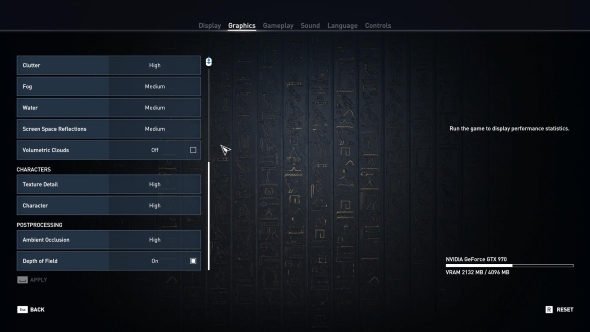 The game features a recreation of massive sections of Ancient Egypt, the earliest time period that Ubisoft have ever visited with the series. But is the PC version of the game a relic of the past or a forward-thinking masterstroke? 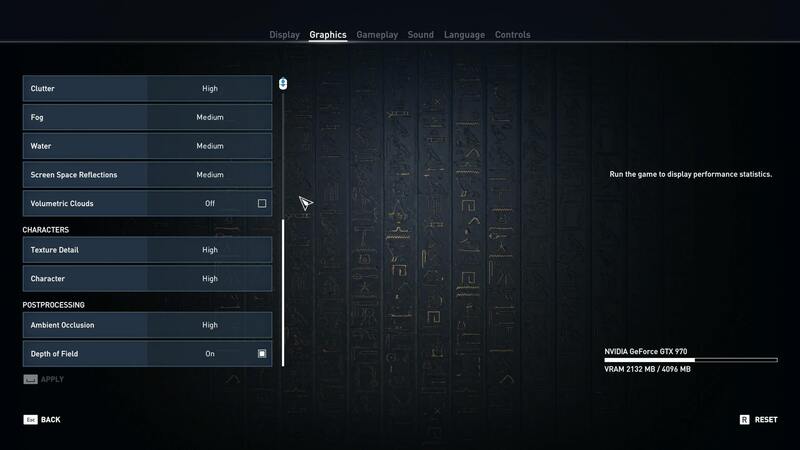 That is what we are here to find out in our Assassin’s Creed Origins PC performance review. 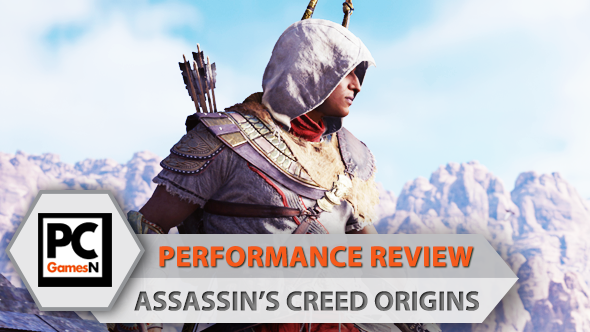 Find out what we think of the game in our Assassin’s Creed Origins PC review. Our performance reviews are written to offer you the broadest picture possible, focusing on hardware similar to what the majority of players have installed in their machines. We test the game on all graphical settings using an i5 powered rig with 8GB of RAM, and try to hit the 60fps mark with four of the most popular graphics cards. Even if your PC is not identical to our test setups, you should still be able to estimate the performance levels you can expect from your own machine. The last Ubisoft game I performance reviewed was Ghost Recon Wildlands, and back then I commended it for having the best graphic set-up menu I had seen in a game. It is therefore a pleasure to find that Assassin’s Creed Origins follows suit with demonstration images that showcase its many varied graphical settings. It is a smaller image than the one in Wildlands, which is a bit of a shame, but it remains just as useful. 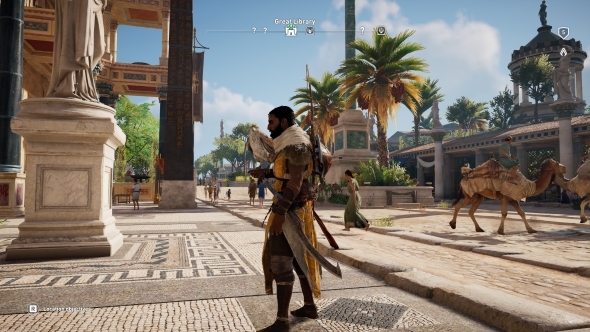 Origins also features a suite of options that continues to prove that Ubisoft are the best triple-A publisher when it comes to handling the PC with care. The graphics menu features 17 options split over four sections: general, environment, characters, and postprocessing. Among them you will find classic settings such as texture, environment, and terrain details, ambient occlusion, anti-aliasing, and shadows, plus more unusual ones such as adaptive quality. That last one alters image quality on the fly to help keep the game at a specific frame rate, increasing and lowering settings as required. This is essentially the technology that allows the Xbox One X to run at 4K. Of course, if you have got a decent PC rig you will want to turn that off, but for those with slightly less grunty machine it is a useful feature to have available. Unlike Ghost Recon Wildlands, there are no alternative options for which anti-aliasing and ambient occlusion technologies you can use. With that in mind, it is not unreasonable to guess that Ubisoft’s bespoke SSBC is at play, alongside Temporal AA, rather than HBAO+ and FXAA. In the ‘pleasant surprises’ category you will find an excellent benchmark tool that reports FPS, CPU, and GPU data, and slaps a score on the results menu in order to help you make wise setup decisions. An FOV slider allows you to expand your field of view in-game (unusual for a third-person game), and a resolution modifier allows you to render the game in higher resolutions than your monitor supports for an even finer image. The best stuff, however, can be found under controls: Origins supports eye-tracking. I know literally one person who owns eye-tracking hardware but it is nice to know he is well catered for. For those of us with tastes less influenced by Star Trek, mouse + keyboard and controllers are also fully supported. For our graphics analysis we compare screenshots taken on the four standard presets of ultra, high, medium, and low. 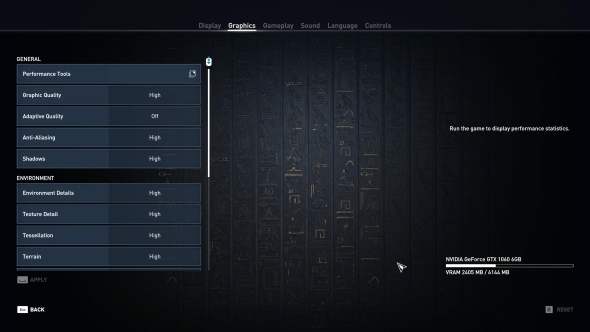 Assassin’s Creed Origins also has very high and very low presets, offering a little extra control without diving into the granular details. As with many modern games, you will need to restart the game if you make graphical changes. 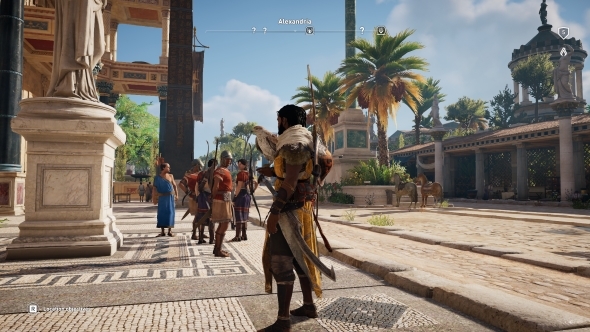 As you can see in the screenshot above, Assassin’s Creed Origins is one of those games that is a real stunner when looked at holistically, but focus on specific elements and you can start to pick faults. NPCs are pretty basic and there is something slightly off about the terrain, but there is no denying it is a beautiful, incredibly detailed world. 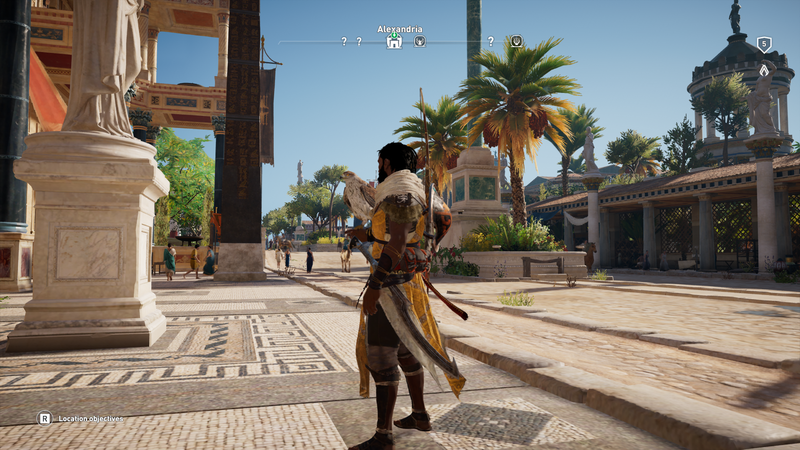 Just take a look at the tessellation on that mosaic floor, the textures on that marble statue, and the vibrant warmth of the colours – Ubisoft’s Ancient Egypt is a nice place to be, especially on Ultra High settings. On a pretty tasty Nvidia GTX 1070 graphics card, the Origins benchmark tool reports an average of 62fps at 1080p, a figure that our own in-game benchmark testing agrees with. It is worth noting that that frame rate is an average of the game as an entire experience; you will find the performance is very dependant on where you are in the world. The frame rate can drop down to around 50fps when in densely populated cities, while rural jungle areas settle at around 70fps. Our mid-range test PC, armed with an i5 6500 CPU, 8GB of RAM, and a GTX 1060, averaged at 53fps. That may be sub-60, but that is no huge surprise considering the density of detail in the world. And remember: that is still better than console performance, both in frame rate and visual fidelity. There are only a few minor elements that act as evidence for High being a downgrade from Ultra settings. Distant foliage is less detailed, appearing more as a bunch of green as opposed to individual leaves. The white banner hanging just right-of-centre also appears to have lost some detail. On the other hand, the hieroglyphics on the pillar appear cleaner at the high setting, which appears due to a lack of dust clouding, suggesting that special weather effects have been toned down. Those changes aside, however, you would be hard pressed to find anything to fault with these settings. It remains a handsome game indeed. The GTX 1070 benchmarks at an average of 69fps, with city scenes averaging in the high 50s and rural ones hitting the mid 70s. That is pretty decent performance for an open-world game as busy as this, with very little sacrifices made. On a GTX 1060, expect an average of around 64fps. The drop to medium comes thanks to a similar scale reduction in quality. 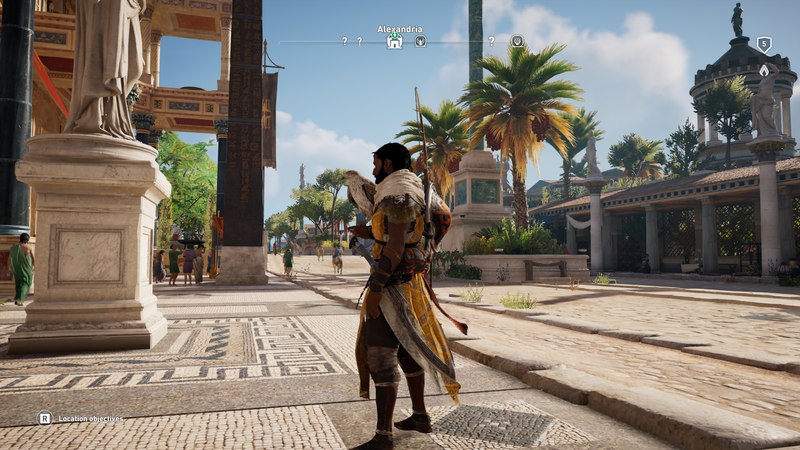 This time you will notice a lack of small-detail shadows; the kerbstones behind Bayek, for example, have very flat shading. Beyond that, it is largely all about reduced texture resolution and detail. You will notice the chipped marble on the circular base of the statue does not appear as sharp, and the mosaic flooring appears a little blurred in places. The definition between each of the stones is not quite as clean cut on medium. Unfortunately, such sacrifices do little to aid performance. The benchmark tool reports an average of 69fps using a GTX 1070, exactly the same as high settings. Rural areas squeeze a couple of extra frames, but busy city scenes remain in the high 50s. On this GPU, the lack of difference simply is not worth the quality drop. The same advice also applies to the GTX 1060, which achieves an average of 66fps. To see Origins at its most basic (well, almost: there is one setting below this), use the low preset. As you can see, it removes many of the effects that make Egypt look special. Gone is the shiny gold light, replaced with flat shading that causes everything to blend into each other. A lack of tessellation makes the floor a smeary mess rather than individual stone pieces, and reduced anti-aliasing gives everything an unwanted sharp edge. Even Bayek, who so far as come off pretty good with each reduced level, has lost his beauty. Like with the previous presets, reducing quality does not actually lead to a huge performance boost. The benchmark tool reads an average of 75fps with a GTX 1070, which is a mere 13 frames higher than on ultra. City exploration settles around the low 60s, while rural caps out in the low 80s. Not the real leap ahead you would hope for, although somewhat understandable considering the depth of assets and detail in this busy open world. If you are running a GTX 1060, expect an average of 68fps. To see how Assassin’s Creed Origins performs on different hardware, we have tested the game on four different graphics cards: two from Nvidia, and two from AMD. We have sampled from both the current and last generation of GPUs in order to offer the most useful information. All four cards are tested on the game’s ultra preset, which dials every texture option up as high as they will go. For the test, we use Origins’ bespoke benchmarking tool, and the results are then verified by performing an in-game playthrough. As you will immediately notice, none of our mid-range test cards manage to hit 60fps on ultra settings. That is not surprising; open-world games are notoriously demanding due to their scale and the sheer number of assets that populate their environments. Assassin’s Creed Origins features one of, if not the most, densely detailed worlds ever made. And we are not simply talking textures: environmental effects like dust, volumetric clouds, fog, and lighting mean that not only does Origins look great on ultra settings, it also demands much of your GPU. It is also worth remembering that a lot of focus has been put on the Xbox One X during Origins’ publicity campaign. The game feels as if it has been developed with extra horsepower in mind, and that means older or lower-end hardware gets left behind. The actual build quality of this PC version is very good indeed, but anyone with a budget rig simply is not going to achieve exceptional performance. Playing Assassin’s Creed Origins on ultra settings with our test cards may not result in a nice, smooth 60fps, but that does not mean the golden standard is not achievable. 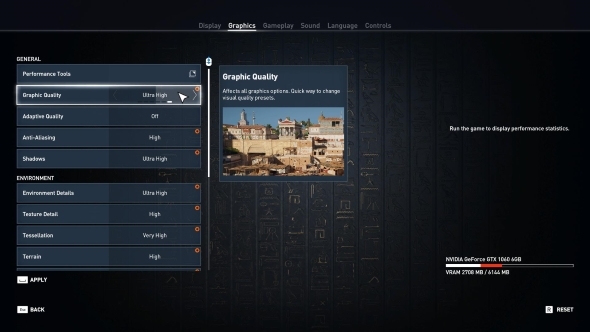 In this section, we comb through every graphics option on each of our four test GPUs in order to find out how to run Origins at an average of 60fps. Bear in mind that this is an average – as previously mentioned, city environments are more taxing than rural areas, so expect to see your frame rate bounce above and below 60fps depending on where you are exploring. For 60fps on a GTX 970, you will first want to turn off one of Origins’ most thirsty features: volumetric clouds. These are beautiful and create some stunning skyboxes, but if we are truly honest they are pretty dispensable. 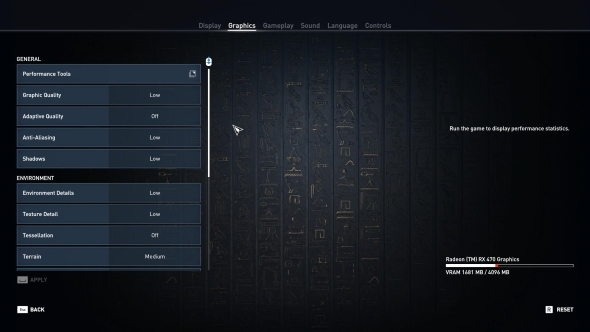 Set fog, water, and screen space reflections to medium, and everything else to high, and you should be able to achieve 60fps without spoiling the beauty of Ancient Egypt too much. The extra power of the GTX 1060 over the 970 will allow you to simply use the high preset, meaning you will get all those beautiful weather effects while still hitting an average of 60fps. Unfortunately, for R9 380 users, there is simply no way of making the card hit 60fps. The best you will achieve is 52fps by using the very low preset. Origins is simply not suited to AMD’s 2015 mid-range card. If you are using an RX 470, you will be in a similar position to 380 users. While the 470 may be a more recent card, it is simply not powerful enough to support Origins’ world. Very low settings will ensure the game is playable, but an average of 55fps is the best you can hope for. Ubisoft have produced a really great PC game for the third time in 2017. It is also very clearly a game for the here and now: anyone with hardware not from the current generation will likely discover that they cannot play the game looking at its best. Less powerful cards can certainly support the game, but the density of Ubisoft’s massive recreation of Egypt means that the performance is never out of this world. I wish the scaling was more effective, but unfortunately there comes a point where old hardware stops being able to keep up with graphical advances. With Origins having been designed with the Xbox One X and PS4 Pro in mind, it likely signals a shift in game design as a whole towards a more intensive future. Do not be surprised if cards like the R9 380 simply cannot keep up by the end of 2018. While it may be demanding, Origins certainly is not sloppy. A plethora of great PC-centric options demonstrates that it is a PC version made with care and attention, and the benchmarking tool is exceptionally transparent with its results: you will see every low point as clearly as the high ones. As such, if you have got the rig to support it, you will absolutely want to play Origins on PC. For anyone with a more modest machine, you may be able to match the performance of standard consoles, but beating those new 4K machines will be beyond your reach.